Polysense Technologies Inc., (Polysense) an innovation leader in LPWAN IoT solutions for fiber and wireless sensing, today announced the commercial availability of image and video capturing on its industry leading LoRa based WxS end node and iEdge computing platform with patented image and video analysis. The Polysense WxS 8800 universal sensor node series incorporates LoRa® devices and wireless RF technology (LoRa Technology) from Semtech Corporation and LoRaWAN™ protocol from LoRa Alliance™. LoRaWAN supports low power, long ranges of 3km to 5km in NLOS (None Line of Sight) urban environments and over 15km reach in LOS (Line of Sight) open space environments. With nine integrated internal sensors and connectivity for an external analog and digital sensor, the WxS 8800 enables a wide range of IoT applications. 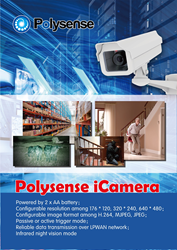 Now With the new image and video capture capability on WxS 8800, Polysense is now the only vendor that provides smart triggered capturing of event detections for applications such as asset protection, perimeter security, senior care where image and video are essential. Located in Santa Clara, California, with offices in Beijing, Luo Yang and Shanghai, China, Polysense develops IoT products and solutions for smart enterprise, city and home, including distributed fiber sensing, LPWAN LoRa, NB-IoT/LTE CAT M and Wi-Fi/BLE based wireless IoT sensors and cloud based data management and analytics platform iView, and edge computing platform IEdge..